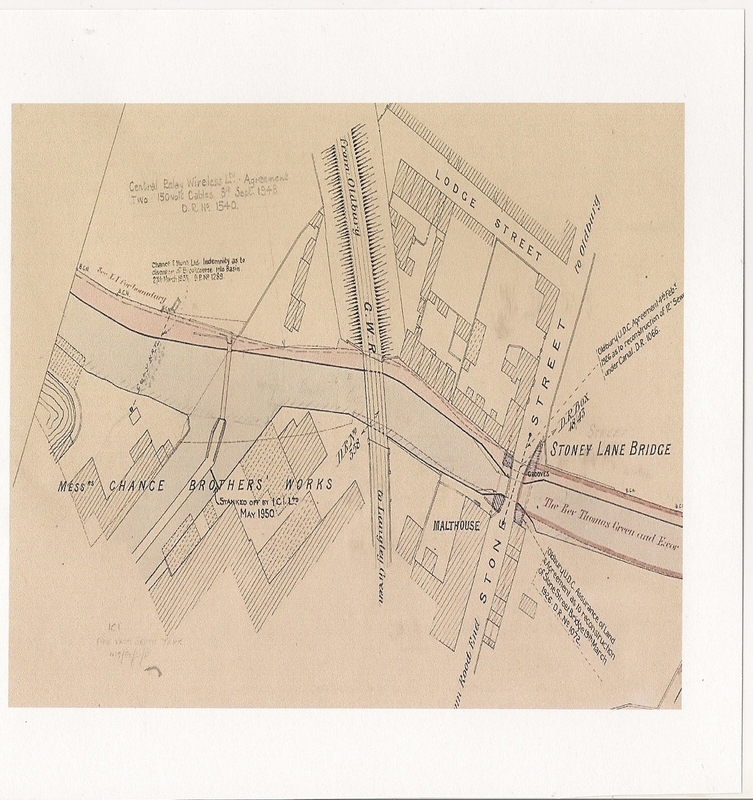 This old British Waterways Deed map shows the entrance to the chemical arm was gained from the Birmingham Mainline canal, originally via the Chance and Hunt owned section, which terminated inside the Albright and Wilson works at the end of Park Lane. Chance and Hunt had their own fleet of boats operating as far afield as Oxford. After the war the arm was used extensively by the canal carrying industry in the area, not just Alfred Matty but Fellows Morton and Clayton- an Oldbury based business specialising in crude tar and gas water carriage between gas works across the Midlands. Their trade in toxic waste carriage became terminal with the building of the M5 motorway over its main Oldbury base at Stone Street and also the decline in gas works in the area. 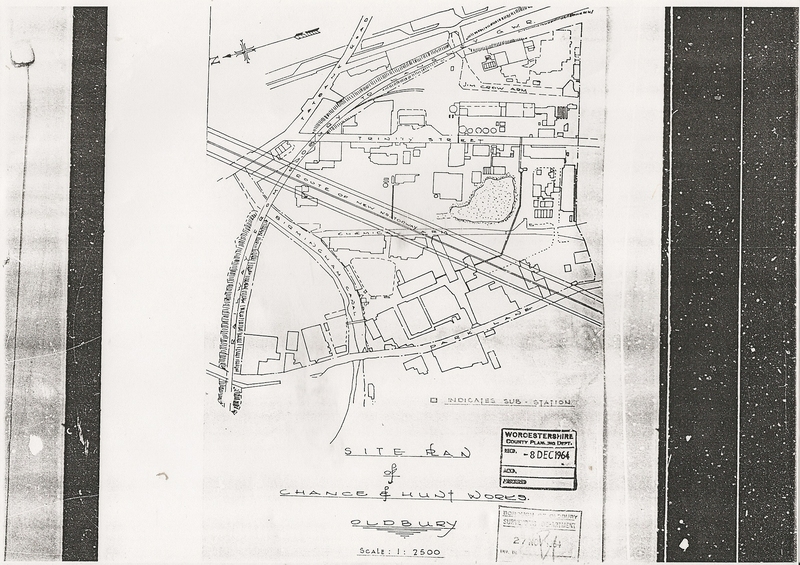 By 1969 planning application W2569 shows that the M5 motorway was under construction and a warehouse complex was to be built on the site of the former Chance and Hunt works. The application and map refer to “a lagoon” and it should be questioned as to what this site was used for? The shadow of the newly constructed motorway provided a cover for the shadowy goings on at the Chemical arm which by now no longer served a useful purpose. An article from December 1977 of Albright World details the infilling of part of the Houghton Chemical Arm inside their works looking towards the M5 with the warehouse to the right of the picture. They seemed to have difficulty with their water at Rattlechain lagoon too! 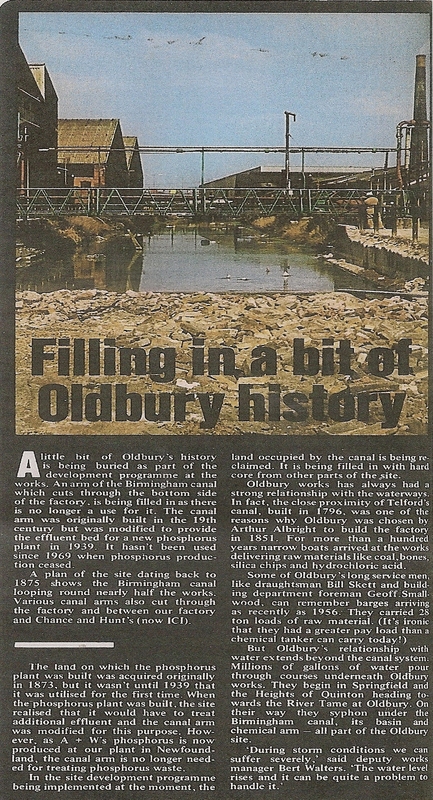 This article appears to be admitting to dumping white phosphorus “effluent” into this canal which was around 400metres in length, and their answer to remediation- burying it with rubble.There appears to be no specific planning application supporting this operation which is very surprising given it took place after the 1974 Control of Pollution Act. Given the types of waste, it appears likely that this would have allowed the timely disposal of any sediment waste into Rattlechain lagoon- BEFORE the waste management licence would probably not have allowed it. Is this the real reason for getting rid of a problem on their works site, to beat the more expensive methods of having to dispose of it elsewhere? In “A survey of the abandoned canals of Birmingham and The Black Country” by Richard Chester-Browne from 1981, the author gives an interesting account of the chemical arm when it was still partially navigable. A grainy picture of the site in his book shows the canal cordoned off with barbed wire, the remainder of the Houghton Arm looking into Albright and Wilson works. Discharges to the canal from the lagoon are regulated by the Agency under a discharge consent. The lagoon is essentially a blocked-off end section of the canal arm and has brick lined walls and the original clay puddled canal bed. Segregation from the canal is by means of a number of metal piles which form a wall facing a concrete barrier; these are badly corroded. Several years ago a bed of calcium carbonate (limestone) gravel was placed in the lagoon to aid the removal of metals. This encourages the deposit of a sludge on the lagoon bed. The lagoon has not been desludged since and the calcium carbonate has become blinded. This sludge build up reduces the available capacity of the lagoon, and hence the retention time and the balancing capacity. It was noticeable that some sludge had been carried over into the discharge channel. Wooden scum boards and oil absorbent material have been installed on the outlet channel from the lagoon. There is also a V-notch arrangement across the channel which is the agreed sampling point. The flow measurement device at this location no longer works and hence it is not possible to obtain an accurate figure for the volume discharged to the canal. Note: Subsequent to the audit, planning permission has been granted for a development involving filling in part of the Chemical Arm canal adjacent to the lagoon. Two 18″ pipes are to be provided to take the lagoon outflow. However, Albright & Wilson are aware that the canal sometimes flows back towards the lagoon, and have expressed concern that a low flow from the lagoon may allow sedimentation and blockage of the pipes”. “The lagoon end barrier was in a poor state of repair, and some drainage channels were seen to be blocked. The possibility exists for a spill to reach the canal, or for it to contaminate groundwater underlying the site. Although some storage/process areas were seen to be effectively bunded, in the view of the Audit Team too much reliance is placed on capture of a spillage at the lagoon and ETP. This is very much an “end of pipe” approach to pollution prevention, and accepted best practice views containment at source as preferable -which is demonstrably the Company’s attitude elsewhere on site. 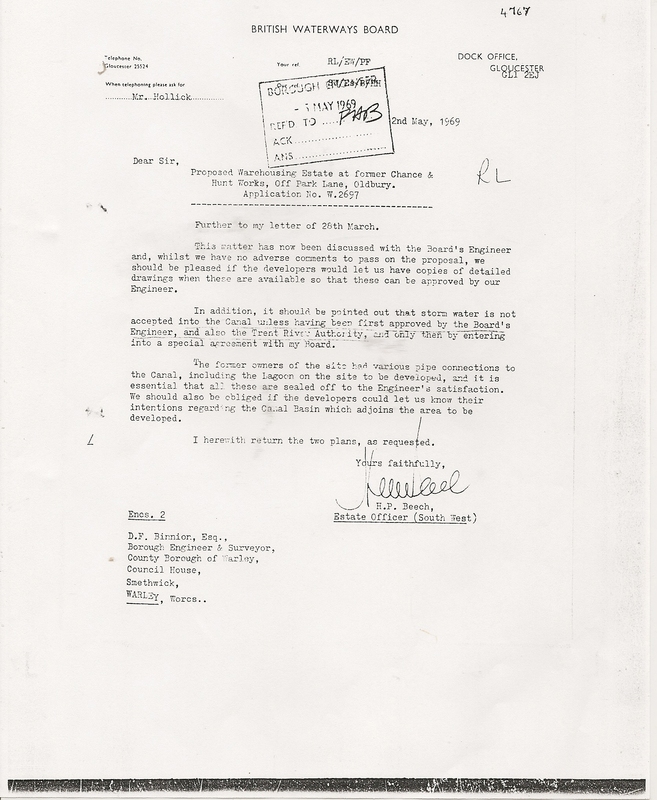 Planning application BCS 3188 granted on 15/9/95 and outside of the Albright and Wilson site allowed the construction of a culvert and Road over the Houghton Branch Canal. 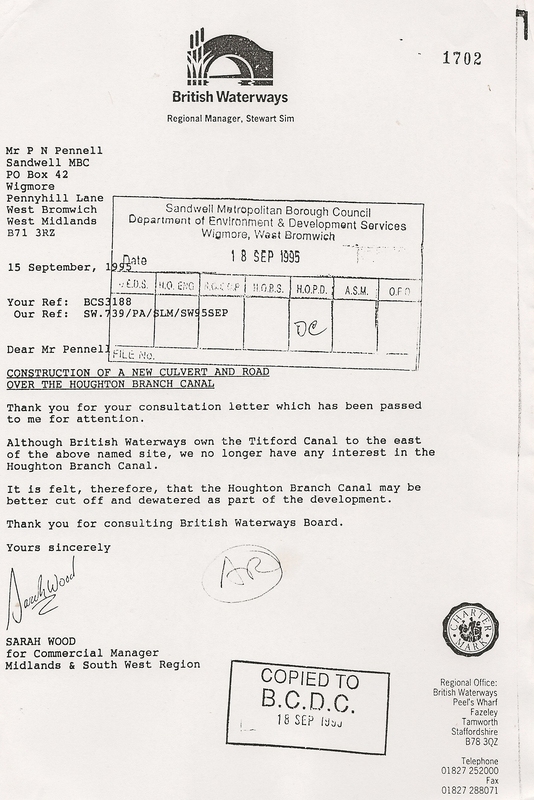 The consultation letter from British Waterways is perhaps typical of the lack of interest in this Private arm, like many of the others on the network that were heavily polluted by the chemical industry that left them in a dire contaminated state. 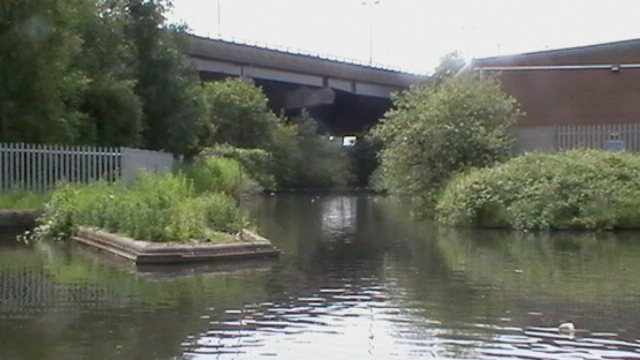 Today all that remains of this section of canal is this visible entrance from the main canal, like that shown at the top of this page, disappearing into the void under the M5 motorway.